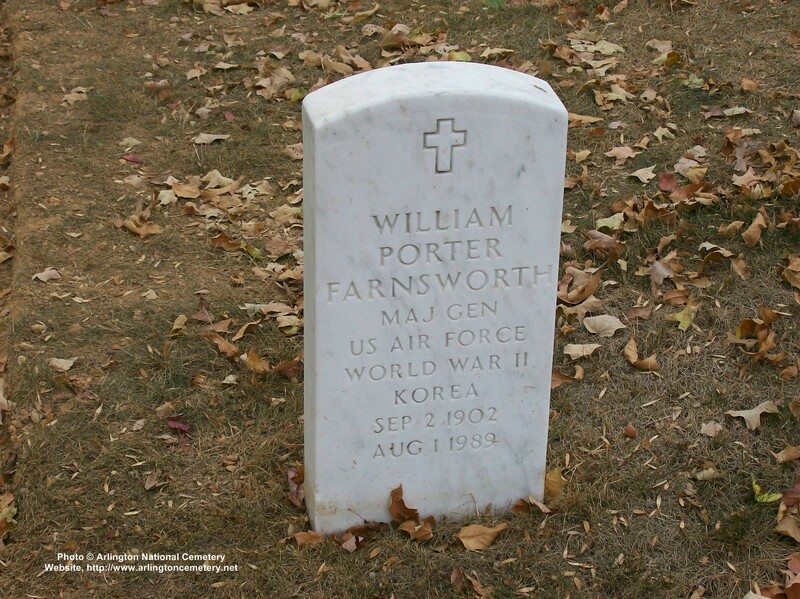 William Porter Farnsworth was born in Montclair, New Jersey, in 1901. He graduated from Dartmouth College with a bachelor of science degree in political science in 1926, and received his bachelor of laws degree from Columbia University Law School in 1933. Following his graduation from law school he accepted an appointment with the National Recovery Administration. Starting in the legal division he later transferred to the administrative side and, at the time of leaving NRA, was deputy administrator. He transferred to the Works Progress Administration first as administrative officer of the Federal Theater Project and later as deputy national administrator. He left this position in September of 1937 to take up the practice of law as a member of the firm of Wittenberg, Carrington and Farnsworth until after the outbreak of World War II. Ordered to active duty in January of 1943, General Farnsworth served in the Materiel Command of the Army Air Corps. On release from active duty June 22, 1946 as a Colonel, Air Corps he returned to private practice with his law firm. Recalled to active duty in March 1948, General Farnsworth was executive to the director of budget, Office of the Comptroller, at Air Force headquarters. From September to December 1949 he attended the Harvard Business School, completed the Advanced Management Course, and was reassigned to the Office of the Comptroller as assistant auditor general. Joining the Air Materiel Command in March 1951, General Farnsworth assumed command of the Northeastern Air Procurement District at Boston, Mass. It was here he received his promotion to brigadier general. Moving to Air Materiel Command Headquarters at Wright-Patterson Air Force Base, Ohio, in September 1952, he was chief of the Quality Control Division, becoming chief of the Procurement Division the following April. Transferred to the Office of the Secretary of Defense in Washington, D.C., in July 1954, General Farnsworth was assistant staff director, Purchasing and Contracting Policies, in the Office of the Assistant Secretary of Defense for Supply and Logistics, and subsequently, staff director for inspection and quality control. On September 1, 1955, he was recalled to the Air Force as the Auditor General. General Farnsworth is a member of the Bar of the State of New York, Federal Court, Tax Court and Supreme Court of the United States. He is also a member of the Federal Bar Association and of Beta Alpha Psi (Accounting Fraternity).